Here's something that you might like to try at home. 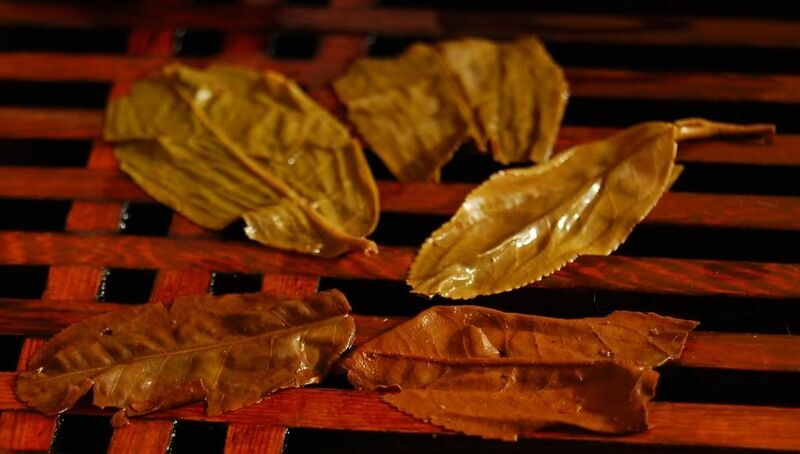 Many years ago, I remember reading (I think at the ever-excellent site of MarshalN) that the "Best Teahouse" in Hong Kong used to keep a tray for their left-over pu'er, into which all the loose leaves would fall from their braeking of bingcha, repackaging tea, etc. Since then, I've been doing the same, and keeping my own left-overs in a big, green tea-tube. Every time I open a cake, there are some left-over leaves rattling around in the wrapper; every time I cut a cake, there are some left-over leaves in my cutting tray. Every time I pack samples for teachums, there are some leaves left over. The result is rather appealing. 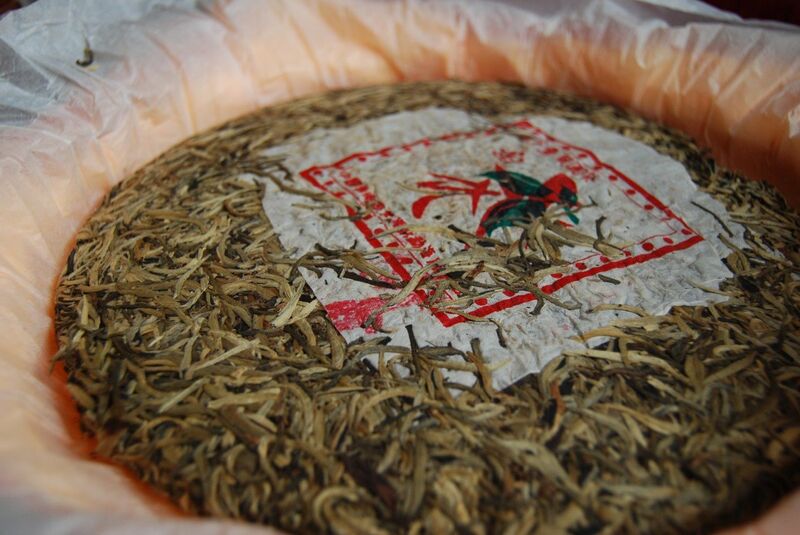 It contains old tea, new tea, good tea, bad tea (thankfully, I'm not getting too much bad tea these days), from all mountains, from all factories. It's a complex tapestry of characteristics that changes from session to session. In the words of Forrest Gump, "you never know what you're gonna get." Somehow, the results are usually very enjoyable - a surprise, I know! It's a small world. The tea-world is especially small, as I'm sure you know. One of my teachums, ST, lives in Singapore. 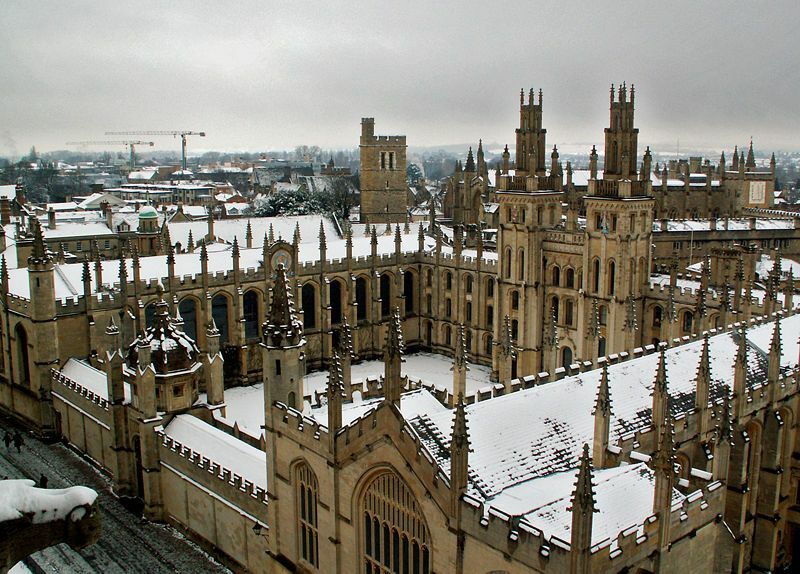 "One of my friends is sending her daughter to law school at your university, and will be there next week", he wrote. "We thought you were one of the students!" she said. I take it as a compliment. 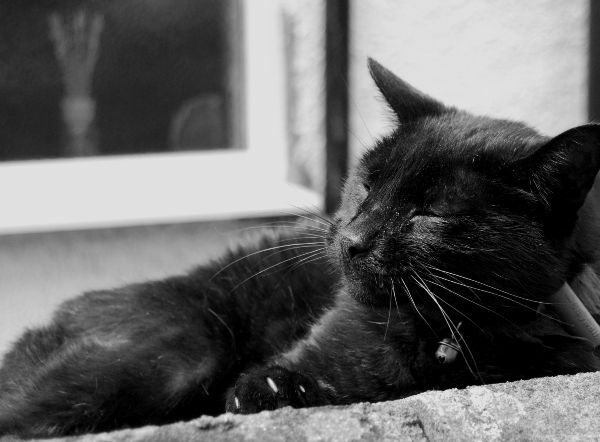 Before five minutes had passed, we were tucked up in the SCR drinking Assam. ST had asked the two Singaporean ladies to pass on the above to me - and what a treat it is. Thanks very much indeed! This is a Menghai special production, with not a "Dayi" in sight. It's also rather sizeable, as you can see from the comparison below with a standard Dayi. 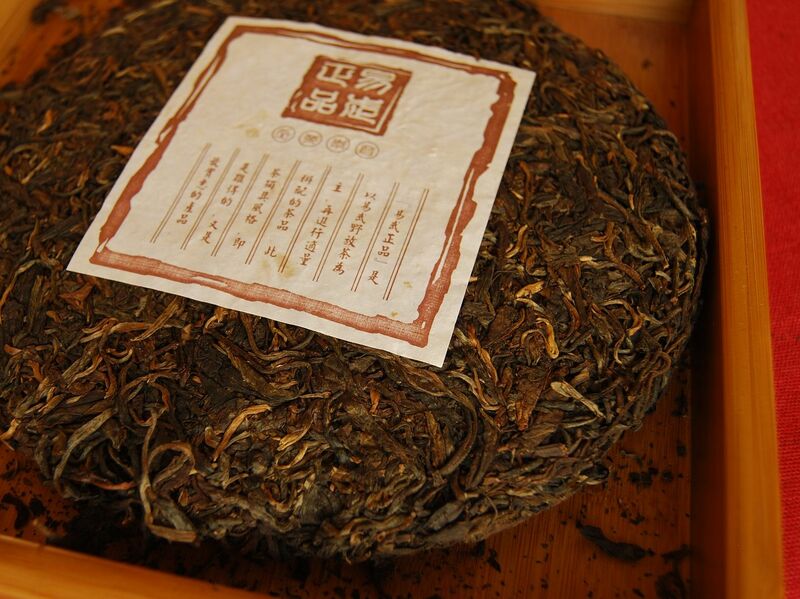 The fresh scent of the tea gives away its "yinhao"-esque status, which you can see below. The entire face of the cake is covered in tips, which run a little way into the cake, before turning into darker basis leaves. 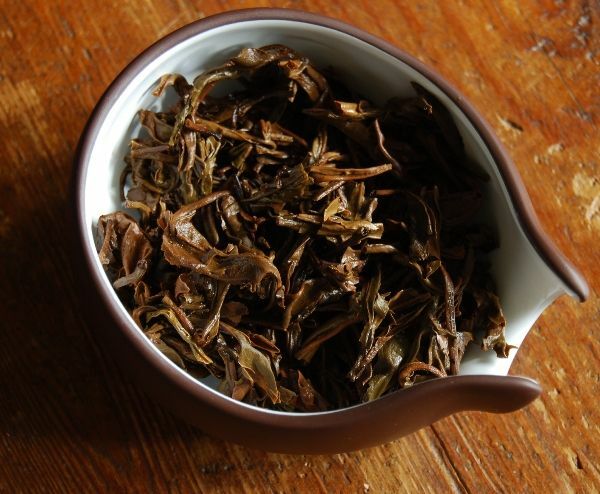 Easily separated, it is a 50-50 blend of tips and darker leaves. 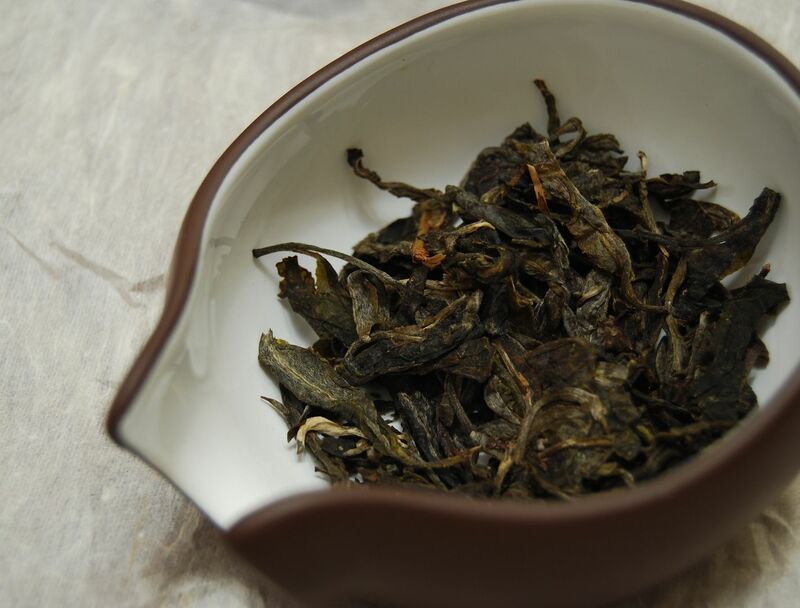 Sometimes, the darker leaves in yinhao blends are pre-oxidised, or "reddened", in the wulong manner. 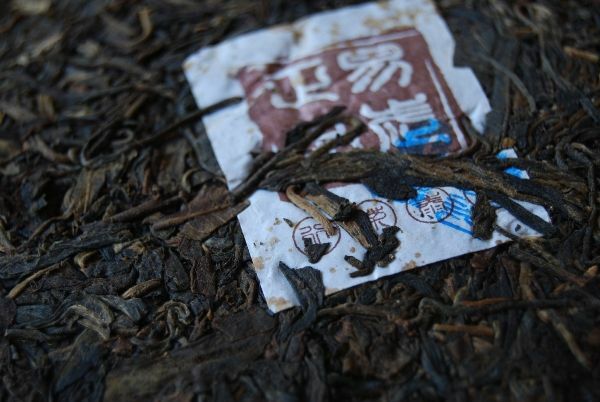 Happily, that didn't happen here: the dark leaves are clean shengpu, which is quite unusual (and much preferred). 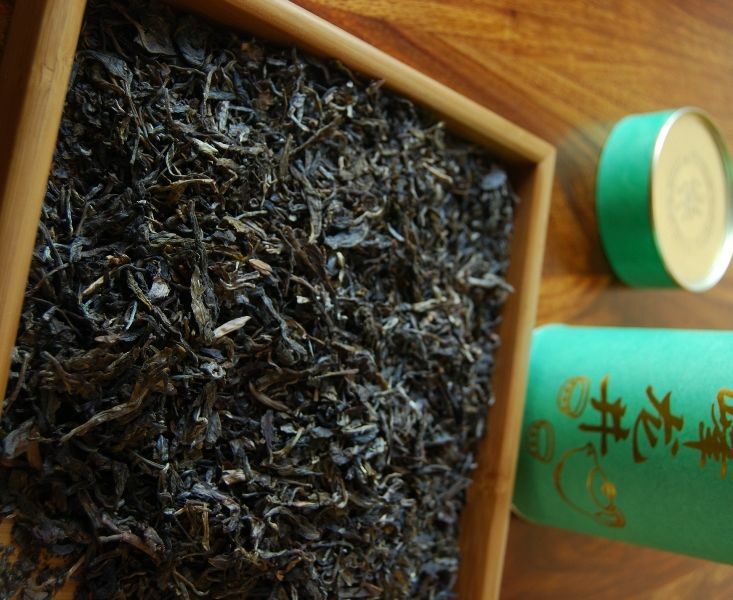 The freshness of the shengpu mixes well with the creaminess of the tips, and gives it a complexity that yinhao usually lacks. 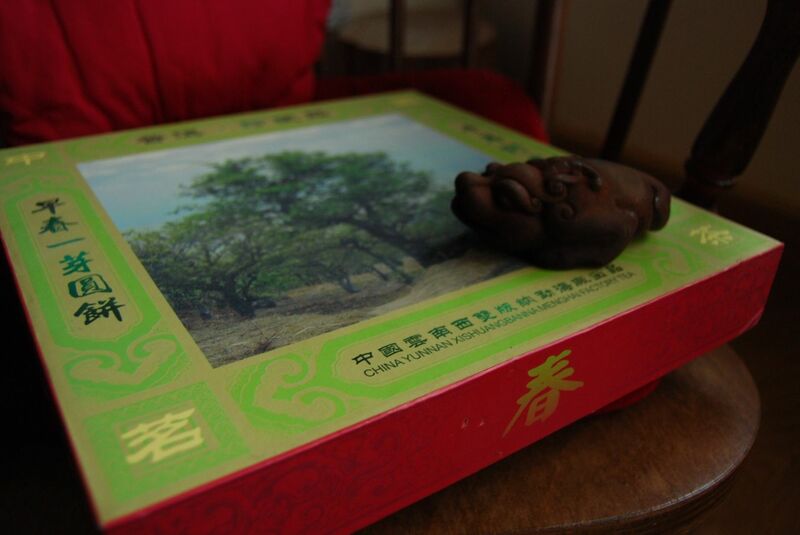 The whole tea tastes rather like sweet pine, exactly as you'd hope a 6-year-old shengpu would taste. 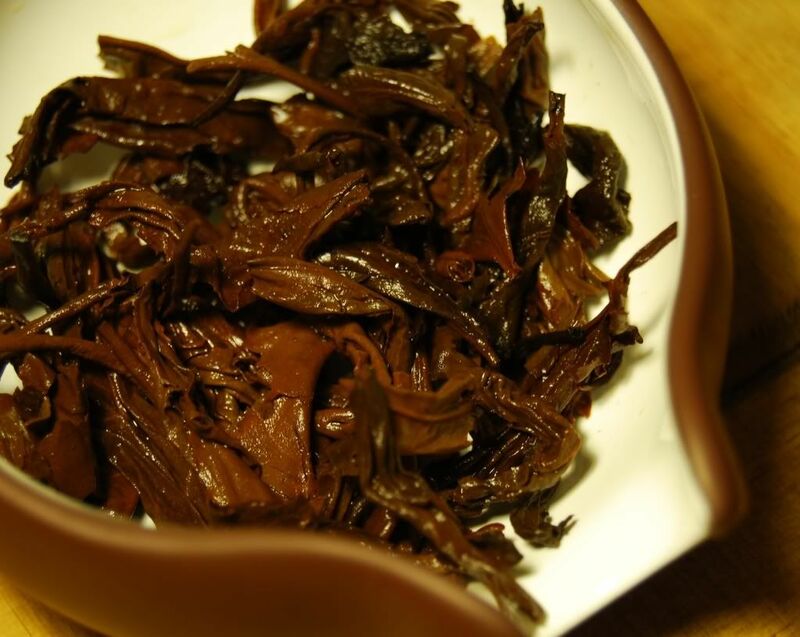 While lighter than ordinary shengpu, due to the tips, it is exceedingly enjoyable. Thanks to its enormous size, I don't see Lei and me finishing this in a hurry! Thanks again to ST for the lovely gift, and welcome to his friend and daughter for the Michaelmas term. 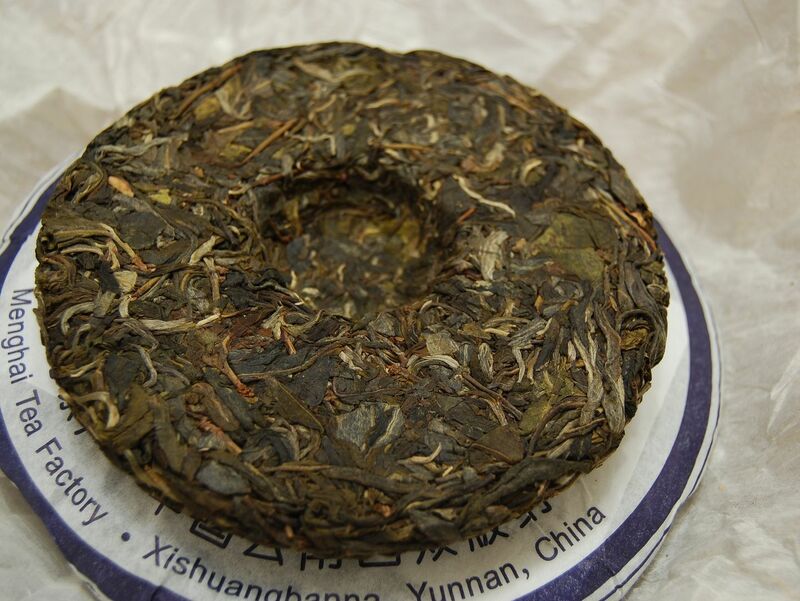 This "one-bud round-tea" was a gift from a friend of ST. I remember their family coming to join me in my college at the time (Somerville). The old SCR there reminds me rather of my dear departed grandmother's house: all tall clocks and big sofas. This large box, due to its size, has been the foundation for a large pile of other boxes. I thought it high time to revisit this tea, after five years have passed. How has the collection of silver-leaves aged? The leaves look a touch darker - the basis leaves, that is. The silver leaves look largely unchanged, as you might surmise from a comparison of the photograph below with those above. 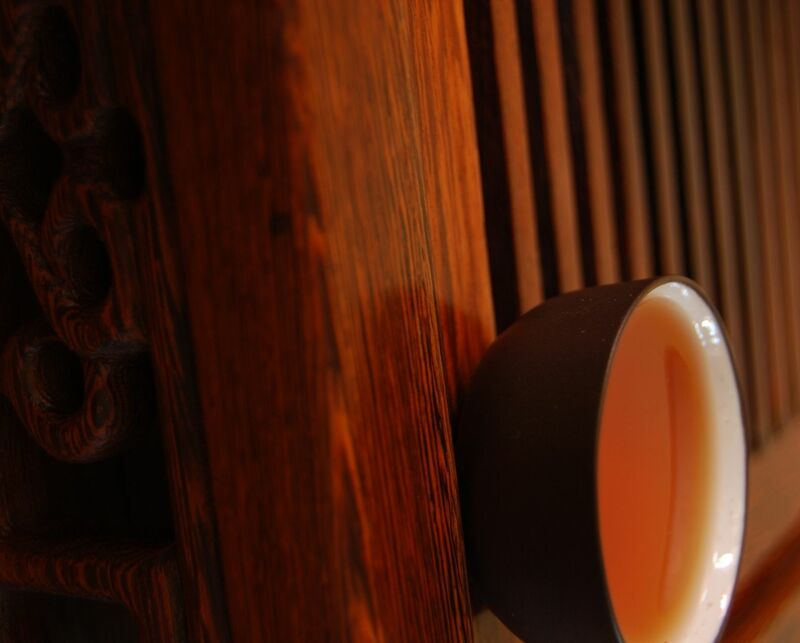 The scent has come on nicely, and we are now treated with a rich, sweet, rather humid pungency. Five years on, the yellow-orange soup has darkened noticeably to orange-red. 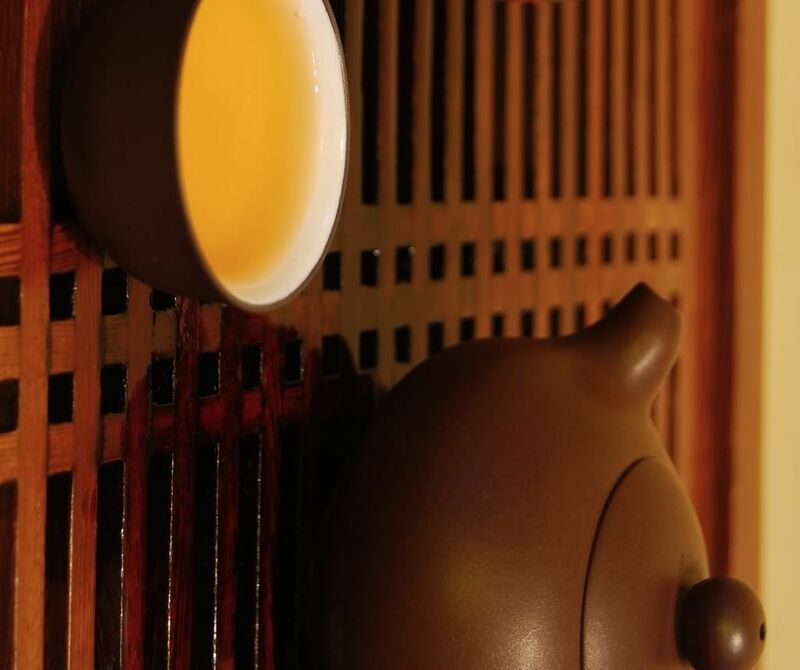 There is a welcome density, and a rich woodiness, to its thick soup that is commendable. 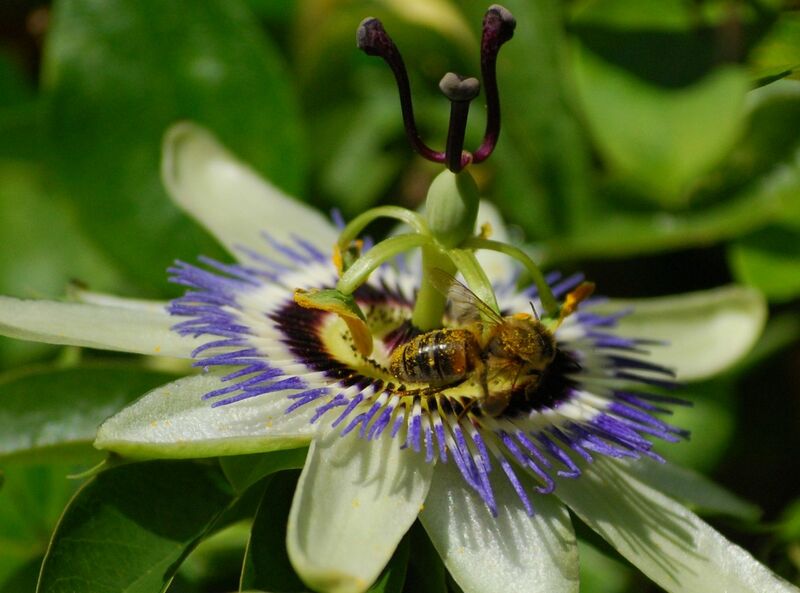 Surprisingly, now at eleven years of age, there is also a note of sweet pollen about it - I would have expected such transients to disappear more promptly, and their inclusion is welcome. Also evident is the rich maltiness of a cake that has found its way around the corner, departing adolescence and entering a new stage of its life. So it remains for a dozen infusions, holding up remarkably well to repeated brewing. I am reminded that Menghai can be very reliable. After five years, this cake has come on nicely, and noticeably. The student, whom ST's family were here to welcome to the university, has probably long-since graduated. 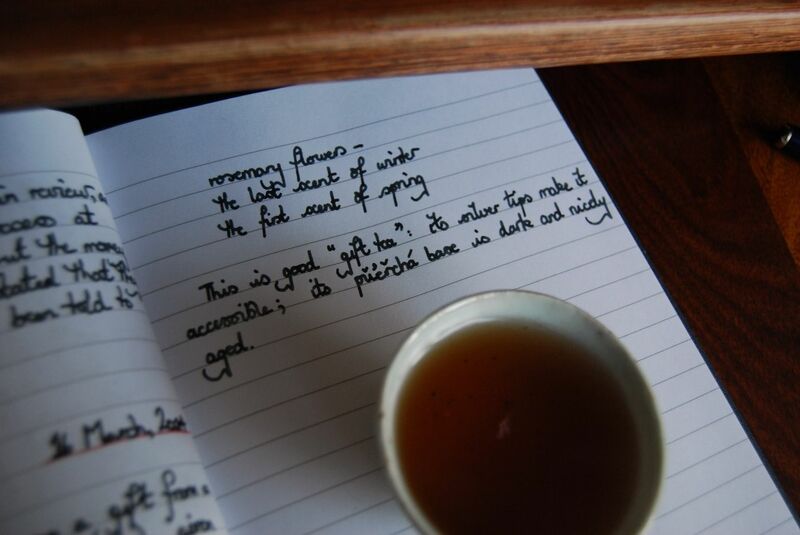 This tea remains a fine memory of that welcome visit. Marvellous stuff, the thin-paper / dry-stored "YYX". Let's update my old notes by revisiting this old favourite: see you there. My good teachum GV has recently been in Hong Kong, where he has been (among his actual academic duties) drinking tea with another teachum of mine, and resident of the once-British trading port, KC. KC has some great tea. 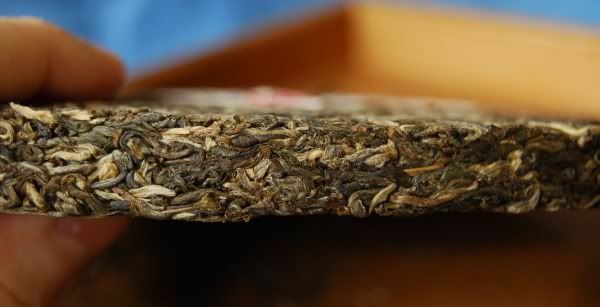 KC has some really very great tea, in fact, and this is one of them: a small-scale production, made in the factory that presses Yichanghao cakes. This is one of a few Guafengzhai [Gwa-fung-djai] cakes that I've had this year. 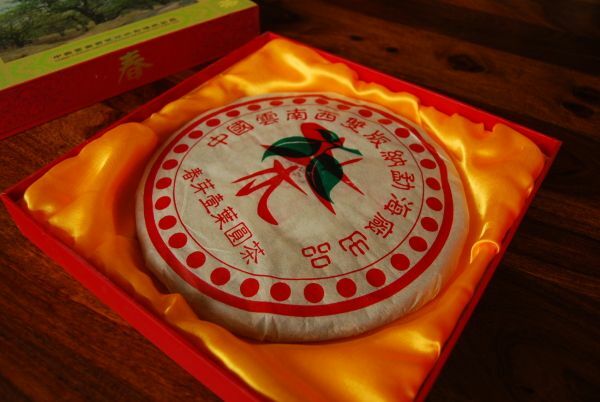 As you can see above in comparison with a standard Dayi (which are quite small), it's not a huge cake. Below, a similar comparison with the denuded Guafengzhai. This little fellow is firm and fruity. The leaves, pictured below, are glossy and covered in down. The perfectly yellow soup that you can see in the photograph below slowly turns orange in the air, as its highly active contents oxidise. 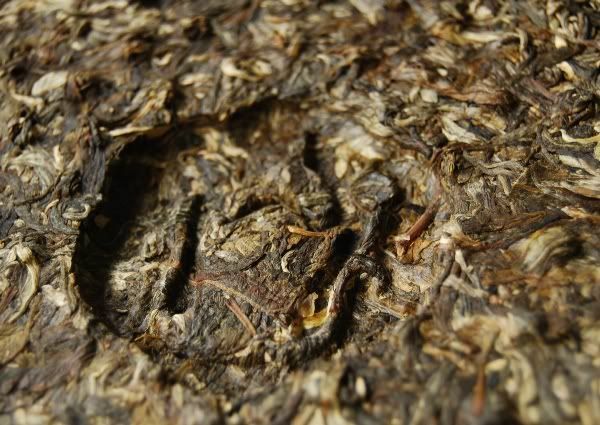 It has tons (and tons) of sweet, sugary scents in the aroma cup, and the flavour is big and bold: lots of sweet grass, butter, and a chunky huigan. 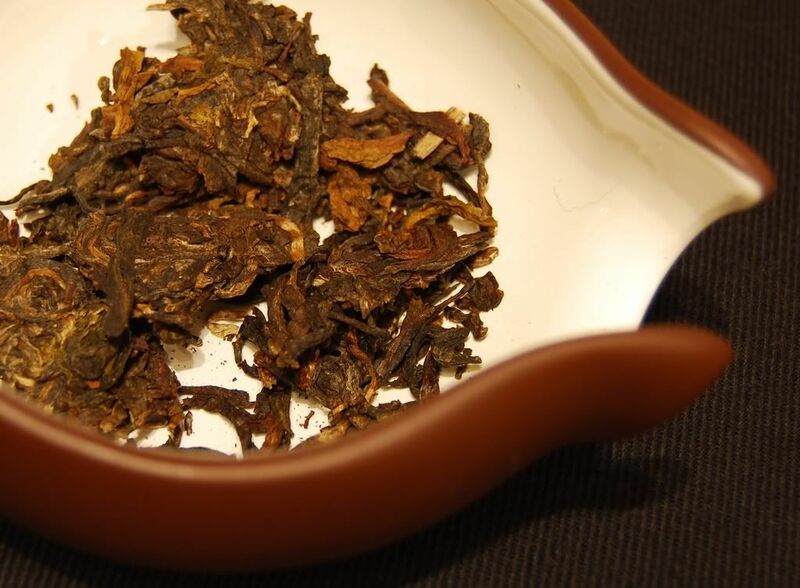 The yunxiang [after-aroma] is a highly complementary sweet tobacco. 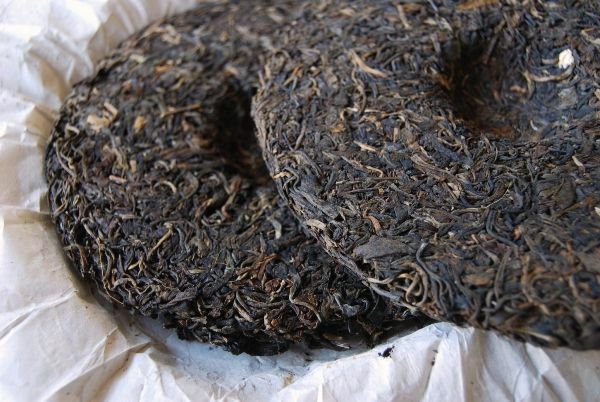 It swells to dominate the mouth, and has an enduring sweetness that blows all of the cobwebs away at 4 a.m. This is seriously enjoyable pu'er. Plenty of kuwei [pleasant bitterness] remains in this cake, which is to its credit - and the credit of its producers. Never fear a bit of kuwei, I say. I'd rather have it bitter today and awesome tomorrow, than mildly enjoyable today and flat tomorrow. Many thanks to KC for introducing Lei and me to these lovely little cakes. Thanks to KC for buying this pair of cakes for me by proxy in HK. 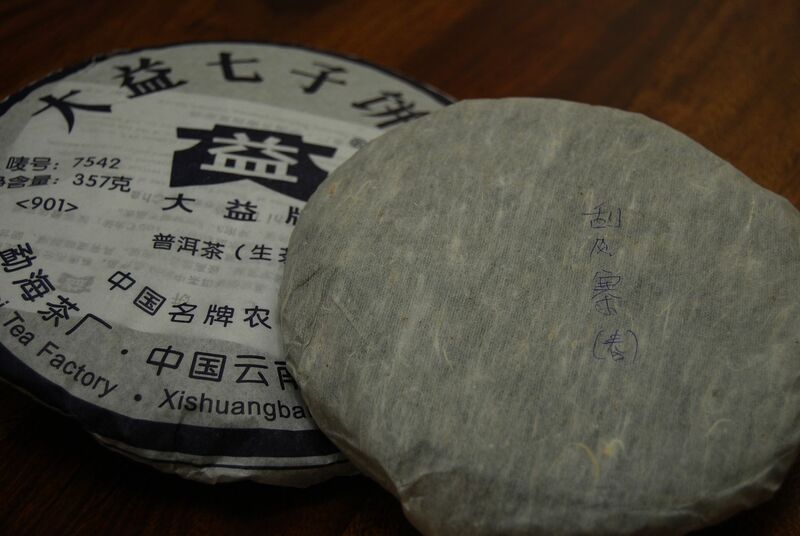 One is gancang [dry storage], the other shicang [wet storage], making for an interesting comparison. 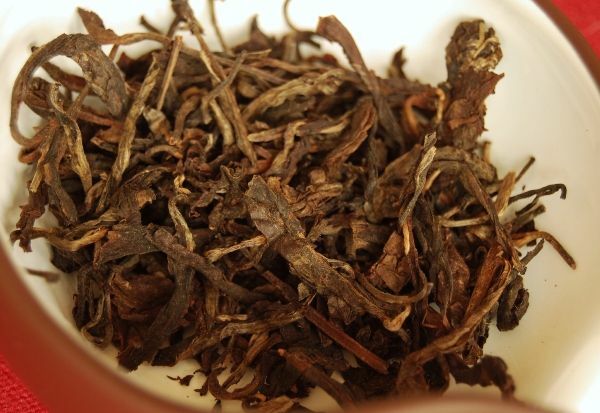 KC settled on the 2004 Zhengpin after comparative sessions with Yichanghao from other years. Good Yichanghao can be very impressive, and I am very grateful to KC for giving me the opportunity to extend my experience with Changtai's famous brand. The cakes, shown below, look sumptuous. The compression is loose, which suffered somewhat from being packed in nothing more than an envelope (! ), but they're mostly fine. The leaves are dark, and perhaps already a touch red. 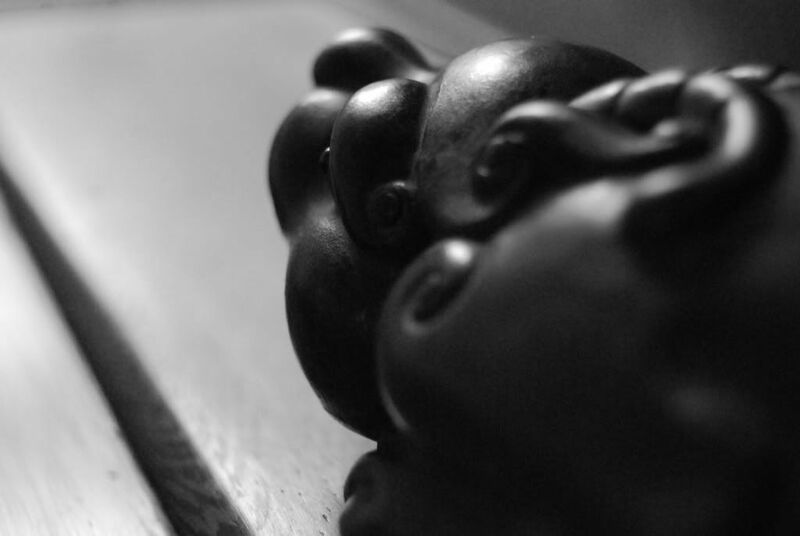 They have the aroma of a little age, in correspondence with their 5-year maturity. Pictured below, in a white-balance nightmare, the gancang cake (lowermost of the two cakes below) can be seen to be darker and richer than the shicang cake (uppermost of the two cakes below), while the latter is almost grey. KC notes that these cakes are made from 2002 and 2003 maocha. As may be seen below, many of the leaves are long and whole. Both cakes are very desirable, it must be said. Following the dry aroma, the soup is a solid orange in both cases. Unsurprisingly, the shicang version is a darker, deeper orange. 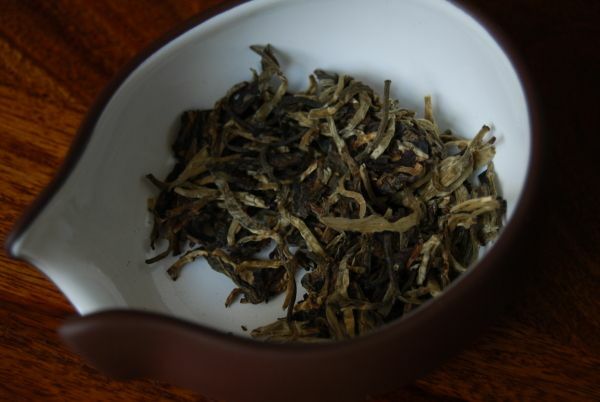 Both have an aroma of sweet, woody, vanilla, but this is more advanced in the shicang version - and, of course, the shicang version has plenty of wet flintiness about it, which I rather like anyway. 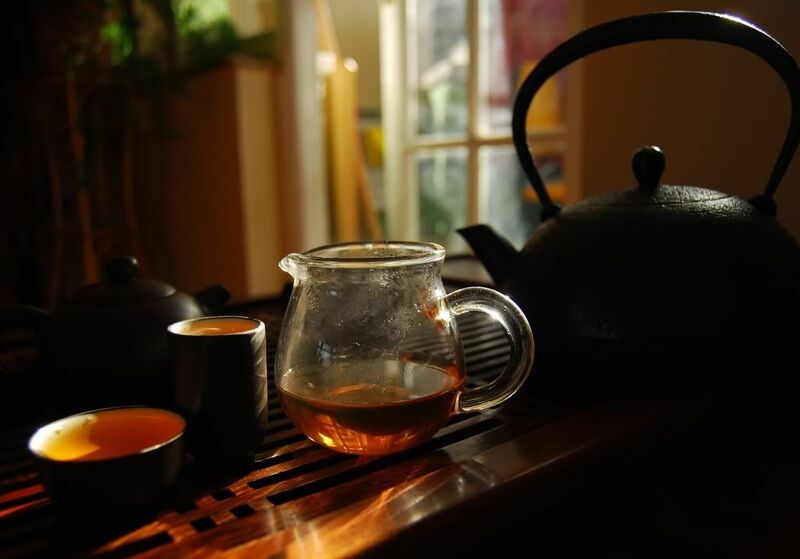 With my eclectic pu'er tastes, I'm just as happy in the gancang areas of Beijing and Kunming, or the shicang-favouring Hong Kong. Interestingly enough, the shicang cake is almost a text-book comparison with the gancang cake: the wet version is heavier and "more aged", and yet it runs out much faster. 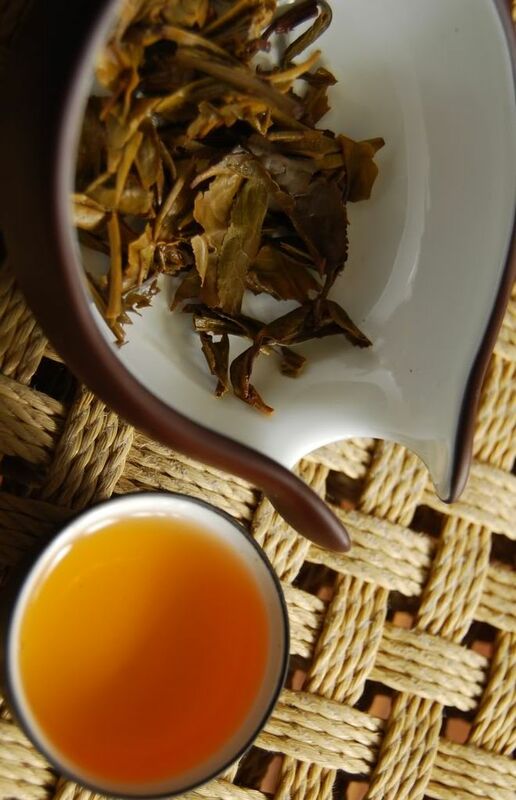 The dry version is sweeter, a touch thinner, but marches on for many more infusions. I enjoyed both of these cakes tremendously - thanks again to KC for finding them for me. 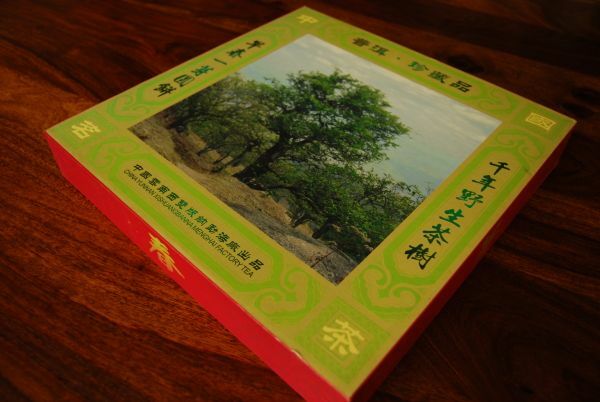 I have since found equivalents for an excellent price on Taobao, and look forward to stocking up the shelves a little. 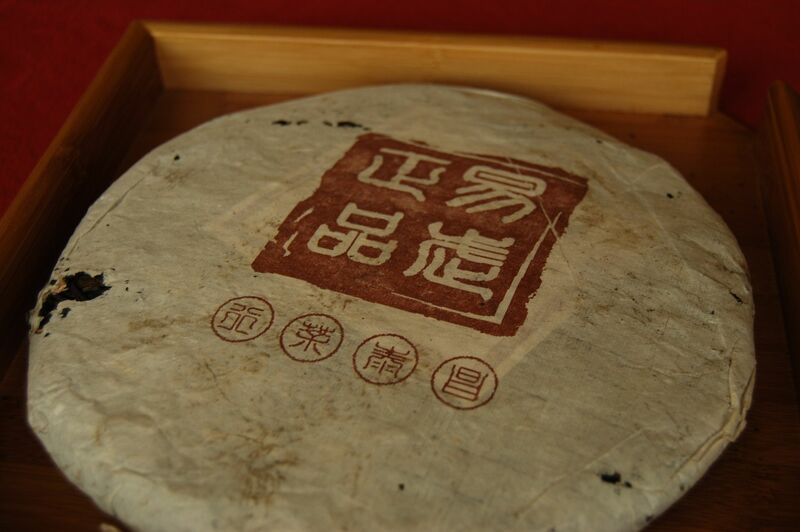 Buy more Yichanghao, pu'er fans of the world! I have several of these cakes, kindly bought for me by KC of HK. 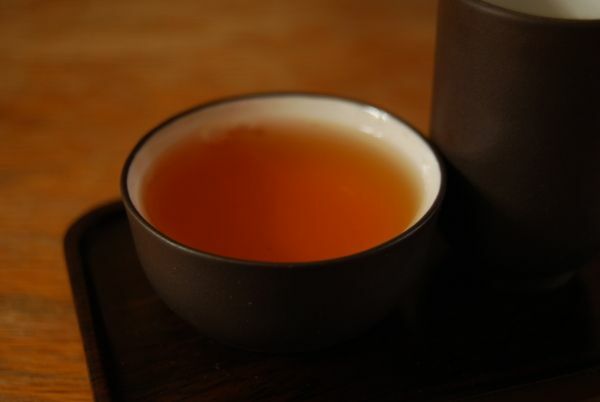 At 4.30 a.m., after changing a toddler's wet bedding and sending him back to sleep, a strong tea is very appealing. Malty, red, and rich: this Changtai is as I remember it. 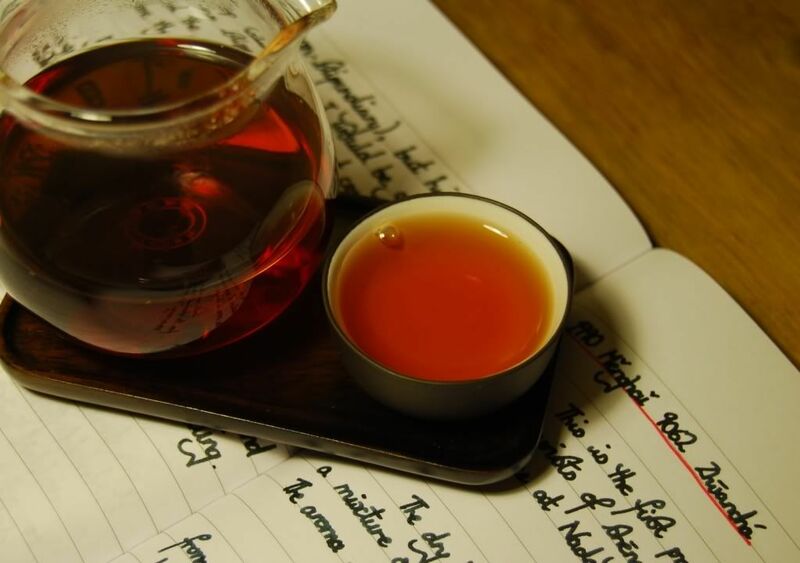 There is an "old-fashioned" Yiwushan feeling to this tea. I am calmed and comforted - the latter most of all. 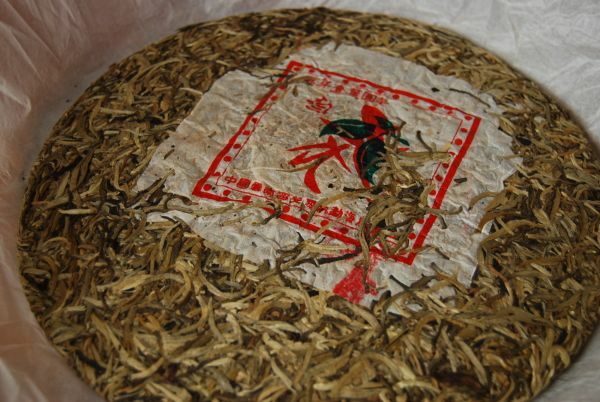 The throat resounds with characteristics of herbal medicine. There is sweetness, but it appears after the medicinal base. 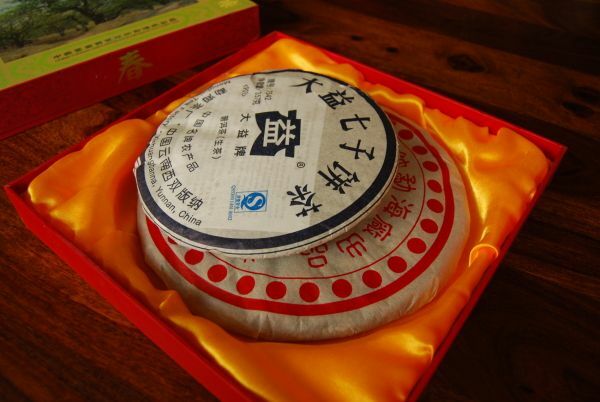 It is smooth and quite thick in its texture, which is another sign of decent quality. I am pleased by this heavy, orange tea. Regular readers may recall that I use a mnemonic device for remembering the various Menghai numbered blends. There are the famous trio: the powerful first-son (7542), the sharp first-sister (7532), and the elegant second-sister (8582). We also have the surprisingly strong little baby (0622). To this family tree, I'd like to add the first-cousin, the 7742. 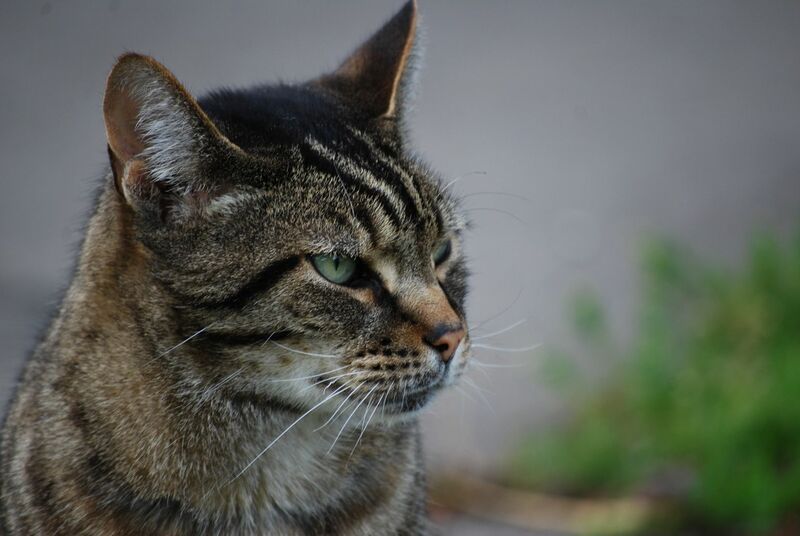 He is two years younger than the first-son 7542, but definitely masculine. Holy smoke, the photography in this article is atrocious. I took these photographs back in February, when Tan originally provided the sample (thanks again!). I must have had an off-day with the camera. At least the rest of the photos will look better by comparison with these monstrosities! Like the 7542 first-son, the 7742 is made from smallish leaves. More darkening has happened here than one would expect for a mere two-year maturity, and this suspicion of interesting processing is further supported by noting a low, smoky aroma. My Xiaguan-sense is tingling. 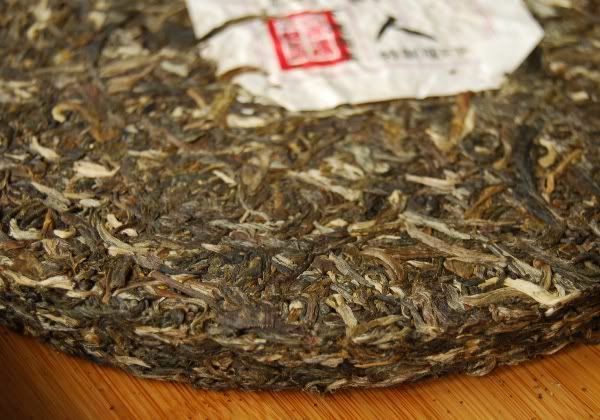 This first-cousin must be a big smoker, because this a smoky tea. The soup comes out (you guessed it) orange. 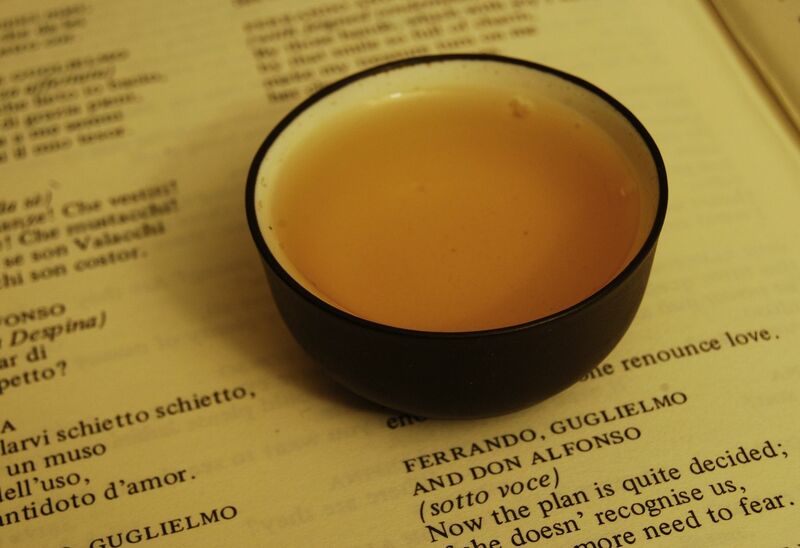 The aroma is that of a factory tea: constrained, clipped, and limited in both amplitude and duration. In its favour, a low sweetness accompanies the smoky flavour. Most of the bitterness has been removed, leaving this tea a dark, smoky husk. Burned savoury grain, light smoke, and plenty of huskiness. Beneath it all, traces of Menghai mushroom and straw. 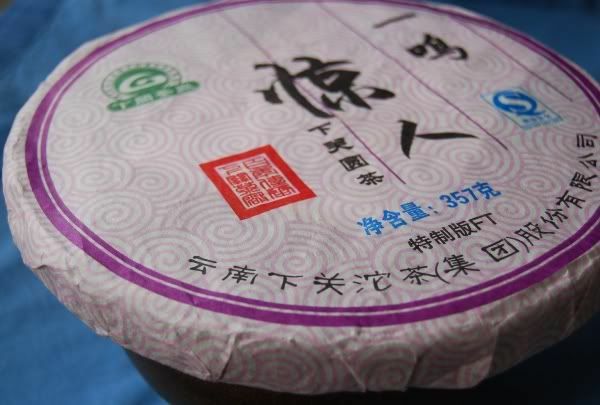 I wonder to myself if 1977 was the year that they invented the "drink-it-now" pu'er, by oxidising and burning out the heart of the tea in order to make it more appealing. If anyone has come across some aged examples of 7742, do please let me know your impressions - I'm fascinated to know how something this heavily processed ages, as it might help me to understand what may become of the 0622 and the modern Xiaguan special productions. This first-cousin is tough, smoky, and burned-out. The poor chap. Many readers will know my opinion on this cake popular already. i) 2008 Xiaguan "Instant Sensation"
ii) 2008 Xiaguan "Great Coup"
iii) 2008 Xiaguan "Overthrow the Government"
It's interesting to see that, while these translations sorta, kinda relate to the meaning of the name "Yiming Jingren", the spirit has vanished. I have come across two explanations of this name, which has come to mean "a humble person causing a great sensation through a simple act." In the Warring States Period, Duke Wei of Qi neglected state affairs, for the first three years of his reign. One of his ministers, Chunyu Kun, who had a good sense of humour, said to him: "There is a big bird which has neither taken wing nor sung for three years." The duke answered, "Once that bird starts to fly and sing, it will astonish the world." The duke devoted himself to his duties and built his state up into a powerful one. 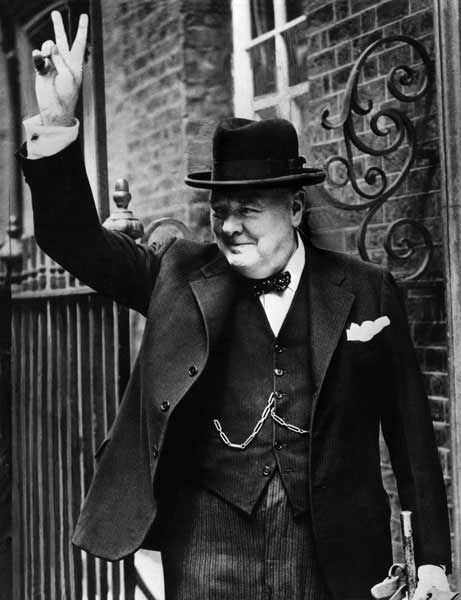 This comes from the phrase "ten years, no sound; one chirp, astonishing people." The apocryphal tale tells of the Emperor's songbird that won't sing. He keeps it for years, and becomes frustrated at its silence. 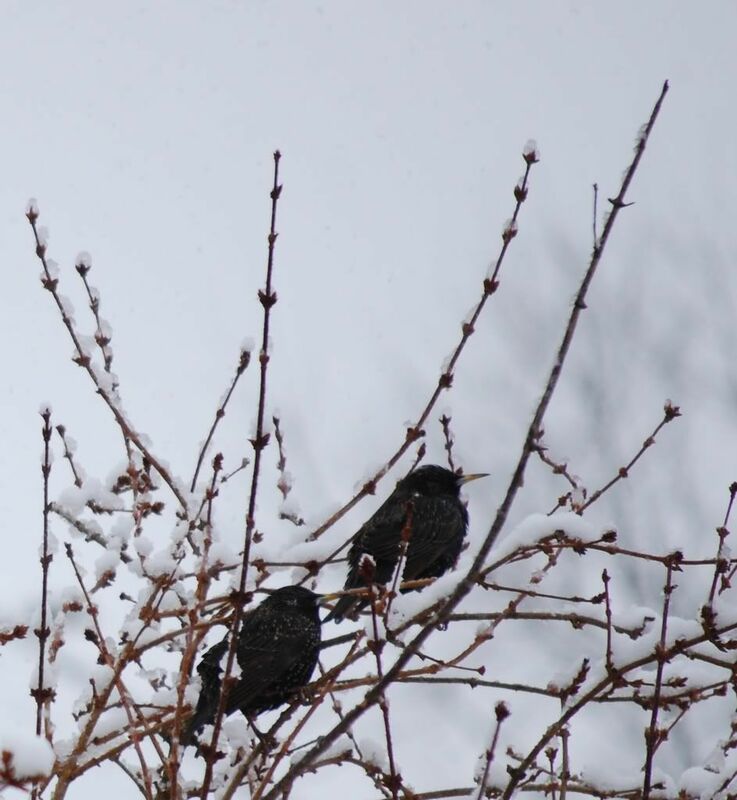 Just as he resolves to rid himself of the bird, it makes a beautiful chirp, and the court is astonished. 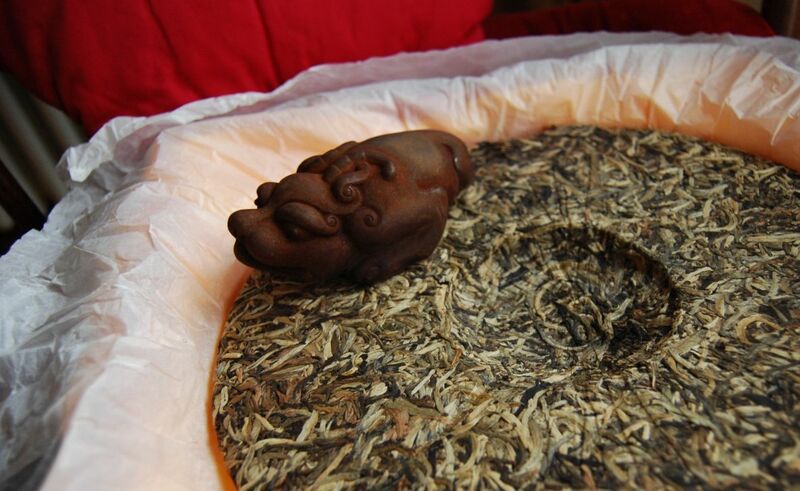 Wouldn't you agree that it is a delightful name for a cake of pu'er? A humble bird, causing a great sensation through a single act of natural expression. I sometimes suggest that the phrase also describes an object which is mute and assumed useless for ten years, only to prove charming at the very last. That's not very complimentary when applied to pu'er! "Everyone thinks that this cake is dreadful for a decade, then they are surprised when it turns out to be impressive." 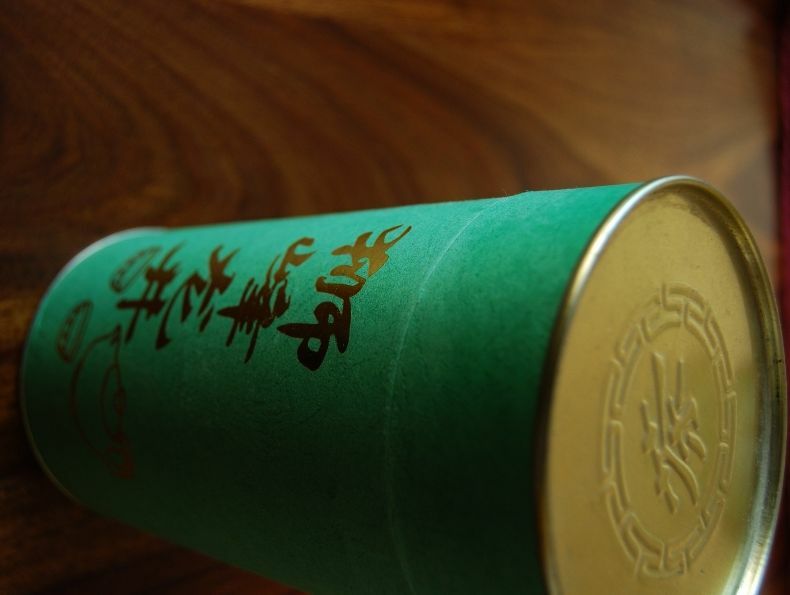 Let's stick with the original interpretation, which is much more fitting for sweet, humble bingcha. As you will have seen above, this is a tiebing [TEE-AIR BING, iron-cake], compressed using hydraulic power. 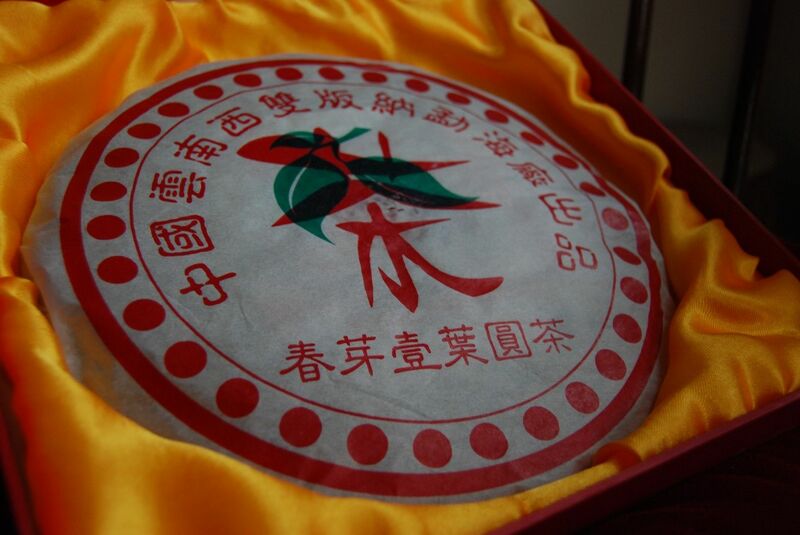 The wrapper tells us that this is a Feitai [FAY-TYE] production, and the impression in the cake is that of the dark, fruit Nanzhao [NAN DJAO, Southern Edict] brand. 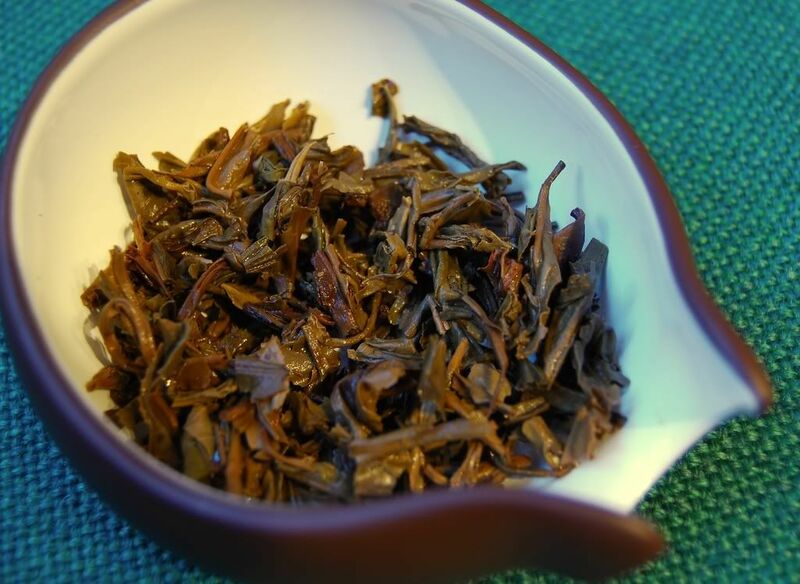 The small leaves have a standard, slightly quiet, sweet aroma that gives little away. This looks like a typical Xiaguan special production: it is yellow-orange, as shown above. 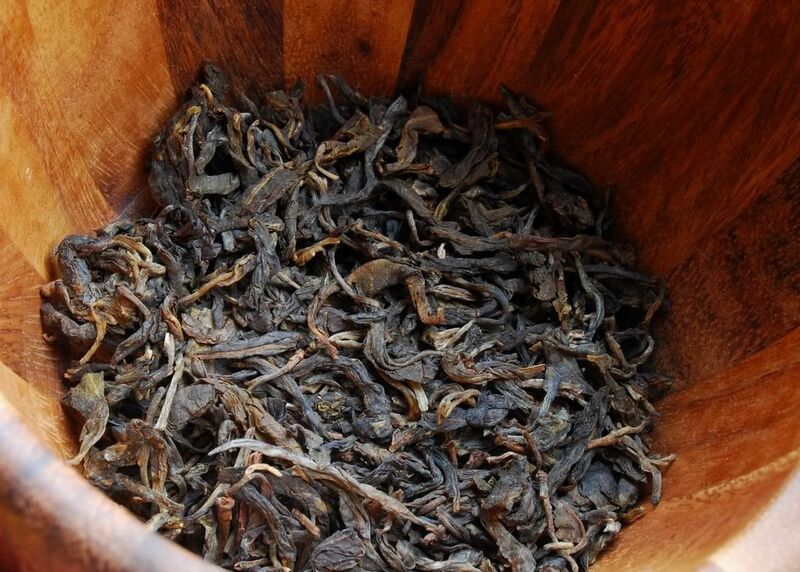 The aroma is very sweet, as is its flavour - almost excessively so. 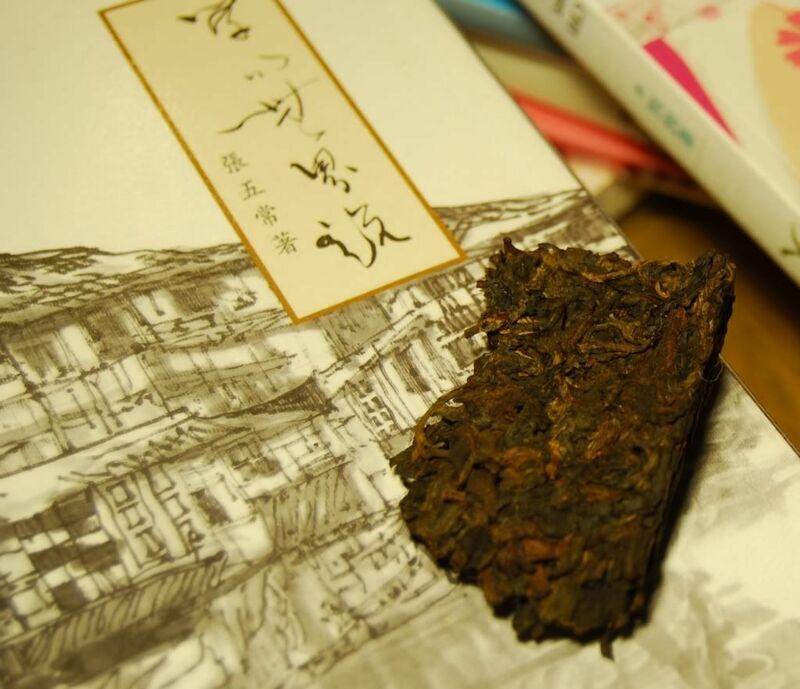 I enjoy its activity on the tongue, its reasonably thick texture, and plenty of Nanzhao fruits in the finish - though it is much sweeter and lighter than the usual darkness of Nanzhao. 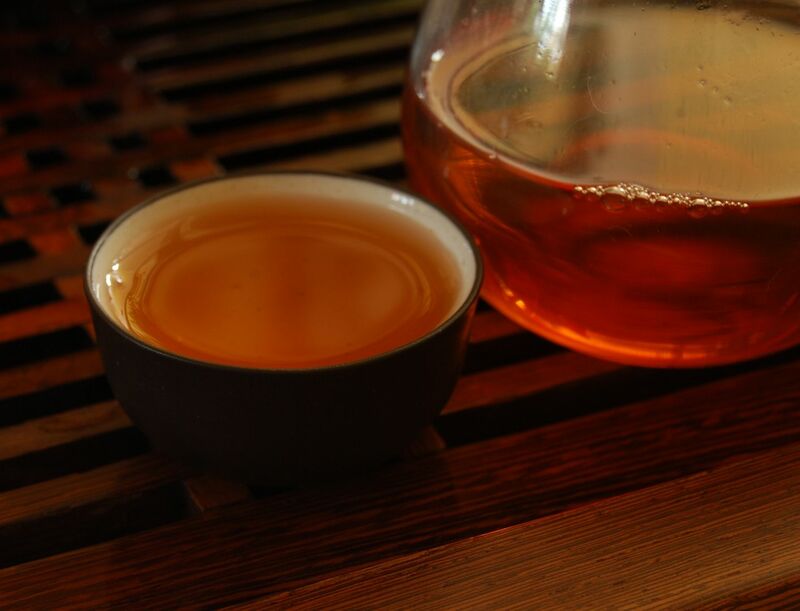 By the seventh infusion, it has collapsed into simple sweetness. 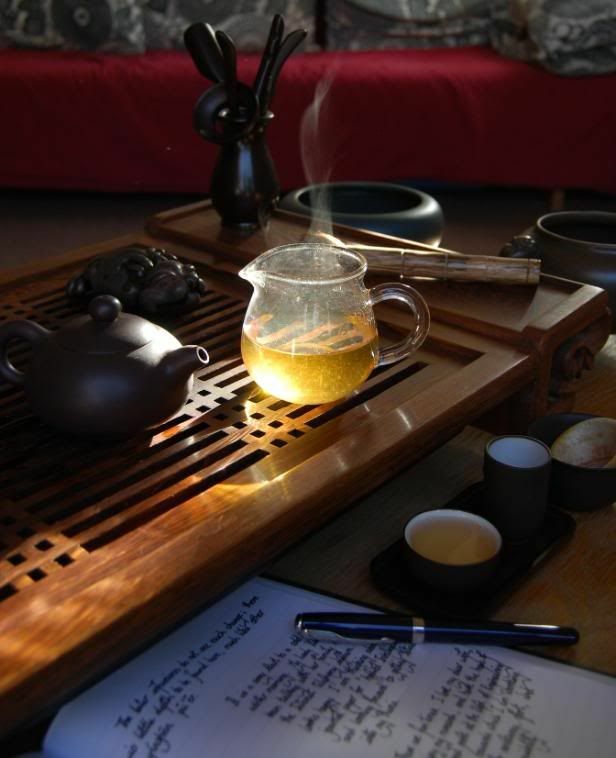 Some roughness in the throat comes and goes, depending on the strength of the brews. I have a cake or two of this tea for immediate drinking; while I do not hold out great hopes for its aging, I do like the flavour of the Nanzhao brand, and this is a sweet, refreshing take on that blend. Some you win, some you lose. I don't know if I won or lost this tea from Nadacha. You certainly seem to get a lot for your money when it comes to samples from Nadacha. This appeals to me, because I get some extra to pass on to whomever I'm next sending samples. Shown above, the goodly sized fragments of this Jingmai cake. The aroma is forthright, clean, and very sweet. Quiet, slow opera; the gentle warmth of the tetsubin; my dear wife looking into a mirror in the conservatory as she dries her face with a small towel. 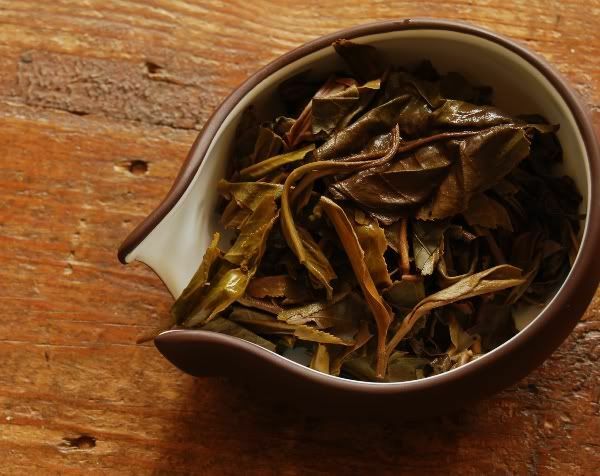 As shown above, the blend is a combination of honest green leaves and "red" leaves, presumably added to give more appeal to those (like me) who enjoy drinking young shengpu. I actually enjoy it more without this kind of blend, but that's just me. It is a sharp and potent cake, and the green leaves support a solid kuwei [pleasant bitter taste]. The texture is particularly thick, and the huigan is enduring. In many ways, this is a good tea. 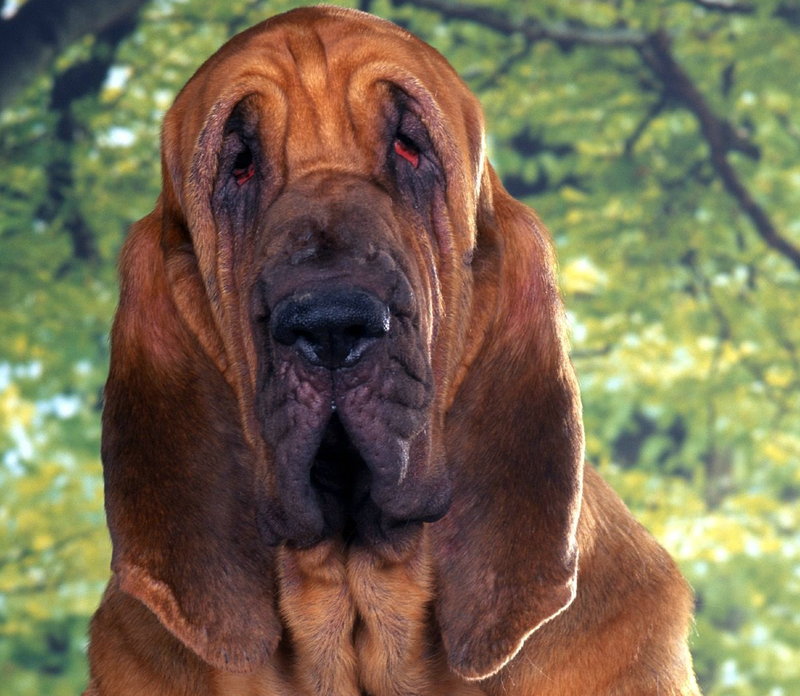 I dawdled over buying a cake, and, by the time I went back to the web-site, it had gone. Perhaps that's the way it was meant to be - while this is a nice cake, it doesn't really thrill me. It has plenty of positives, including some fine floral notes in the nose along with all that thickness, but I wasn't deeply impressed. It's the kind of cake you could take or leave - and it looks like it decided to leave without me, thus saving me the decision.